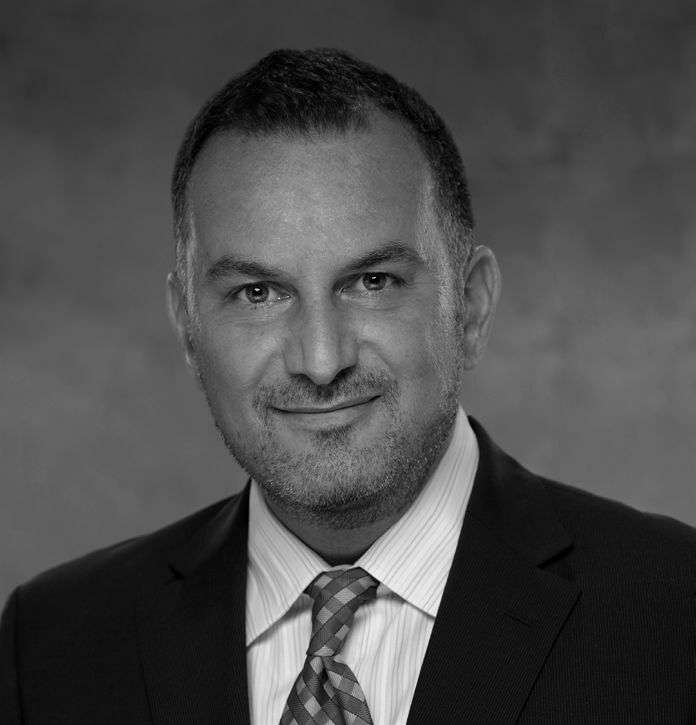 Kyle Normandin is an Associate Principal with Wiss, Janney, Elstner Associates, Inc., in Los Angeles, California. He has contributed numerous technical publications on architectural conservation of cultural heritage and currently serves as the cochair of Technical Committee of Modern Heritage for the Association for Preservation Technology. He also serves as the Chair of the Docomomo International Scientific Committee on Technology (ISC-T) since 2010. Kyle holds a BA in Architecture from UC Berkeley and an MS in Historic Preservation from Columbia University in the City of New York. Kyle currently continues to serves on the bureau of ICOMOS ISC20C and on the Editorial Advisory Board for the Journal of Architectural Conservation. As architects, we recognize and appreciate Modernist, post-War architecture as much for its honesty and clarity of form as we do for its use of what was once considered leading-edge and, at times, untested and controversial new materials, technologies, and methods of construction. Though frequently overlooked in favor of the richly adorned Classical architecture of our more distant past, many of the technological advancements in both design and construction that we see today owe their very existence to the risks that were taken and the challenges that were overcome as part of the post-War Modernist movement. Now approaching 70 years of age, too many of these buildings suffer from the inescapable effects of aging, deferred maintenance, and years of neglect. As practitioners and stewards of our built environment, we are called upon once again to rediscover these buildings and to re-imagine their use in a way that preserves the integrity of the movement they reflect while also re-introducing them to an increasingly skeptical and incredulous audience that demands environmentally conscious, energy efficient, truly sustainable design. Today, many significant buildings from the Modern era are at risk of neglect or demolition. While many of these buildings were created at a time when our society was mainly industrial, we continue to use them in a post-industrial world. These buildings often require constant maintenance and repair, and we must balance new technological standards while addressing comfort issues and environmental goals. Oftentimes, technology becomes obsolete while building standards become more stringent. In many cases, building materials and systems of the Modern and postwar eras have reached the end of their physical and economic life span and require repair or replacement. Dutch Architect Hubert-Jan Henket notes, “Twentieth century buildings, in particular Modern Movement buildings, are more susceptible to the influences of time than their predecessors and as a consequence, this exposes them even more, to the paradox of conservation”. While it was generally expected that the buildings would become obsolete at least once or twice during their life span, it was not envisaged that the building envelope, materials, and, in some cases, the structure itself would show signs of obsolescence after only twenty to thirty years in service (Chandler 1991, 18). The temporal quality of prefabricated materials and systems has changed the face of building construction. In some cases, we are faced with a quintessential paradox: the desire to make permanent buildings and structures originally designed only to serve a relatively short life-span. One important question raised by architects of the modern and postwar eras was how building design should respond to the rapid changes in society. Two different principles and approaches arose. According to architecture critic Adolf Behne in 1926, buildings were distinct in their functionalism or rationalism. Functionalism is when an architectural form follows the function closely, to yield “close-fit” architectonic design that may no longer work when the function changes or becomes obsolete (De Jonge 2005, 289). Often, if the building is not adaptable, there is a strong possibility that it will have a short life span. 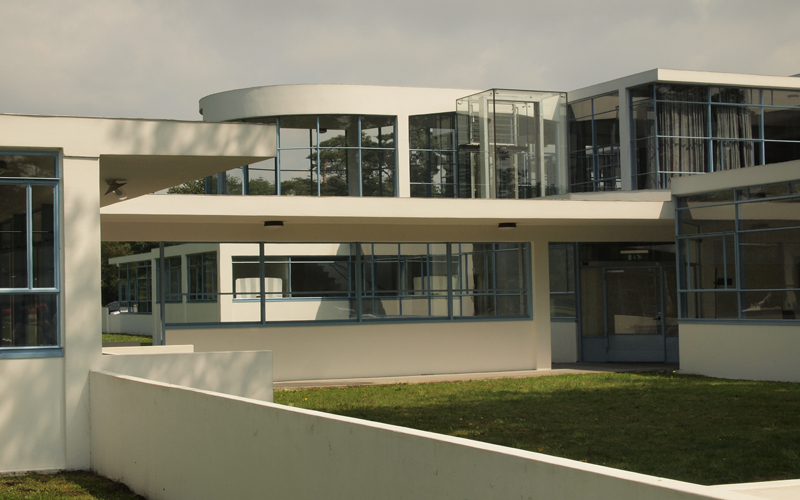 For example, the Zonnestraal Sanatorium in Hilversum, Netherlands, designed in 1926-1928 and completed in 1931, demonstrates these conservation challenges because of its structure (fig. 1). The short life expectancy of this building design aligns with the preconceived notion that tuberculosis was to have been eradicated in about thirty years after its construction. 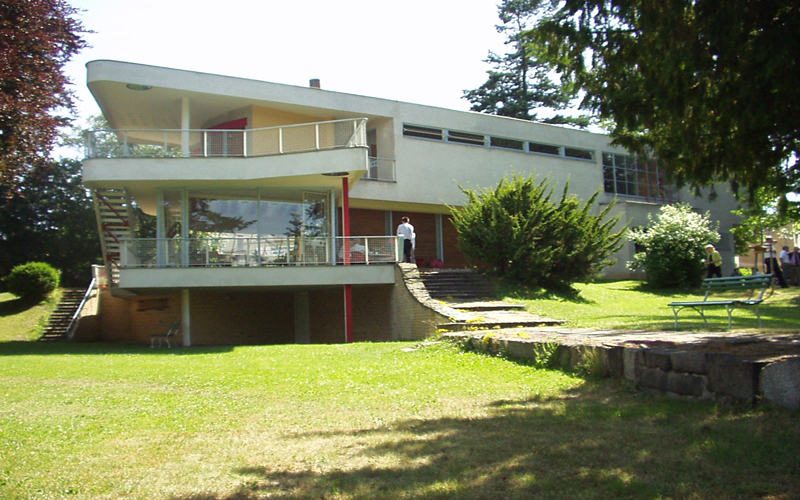 For this reason, the sanatorium was built of industrial products and used construction techniques including the dry assembly of prefabricated building components and a stick-built curtain wall. Simplified installation and construction that could be executed with inexpensive labor resulted in significantly lower costs at the time of construction. It was also thought that innovative buildings could be constructed using a smaller quantity of material than necessary for traditional buildings, as demonstrated by new building envelopes that were quite thin, delicate, and streamlined (De Jonge 2008, 29). By comparison, rationalism is based on a more flexible building design program where spaces are used for various functions. These buildings often consist of a concrete skeleton with long ribbon windows, in which interior layouts may adapt over time. For example, the design and rational planning of the Van Nelle Factory in the Netherlands allowed for a multifunctional arrangement of space; the interior spaces could easily be modified in response to new uses for the building. Industrialization throughout the twentieth century allowed the affordable production of materials like iron, steel, and glass, as well as reinforced concrete, which developed into one of the most universal and versatile materials in building construction. In addition to its industrial and economic efficiency, concrete could be used to realize building forms that were aesthetically inspired by automobiles, aircraft, and ocean liners (Mills 1994, 151). There was not just a fascination with materiality, but also with the repetitive nature of the manufacturing process itself. The desire to improve production of prefabricated materials, including their assemblies and performance, resulted in a proliferation of standardization. As early as the first International Congress for Modern Architecture (CIAM) meeting in 1928, ideas about the simplification of building forms were a focal point within the Modern Movement. On the one hand, a steady rise in the production of standardized components based on geometric shapes increased economic viability by ensuring that such components could be made universally available. On the other hand, this trade-based industry retained support for a more customized approach to creating components for particular designs based on unique organic forms. Such components were more costly than standard prefabricated components (De Jonge 2002, 51). Advances in technology provided the capacity for larger building systems. For example, the repeated and systematic use of certain individual building components (such as webbed trusses, laminated wood beams, arches, prestressed concrete assemblies, and precast concrete and composite systems) contributed to the development of new ways to use these components to span large spaces without intermediate columns. 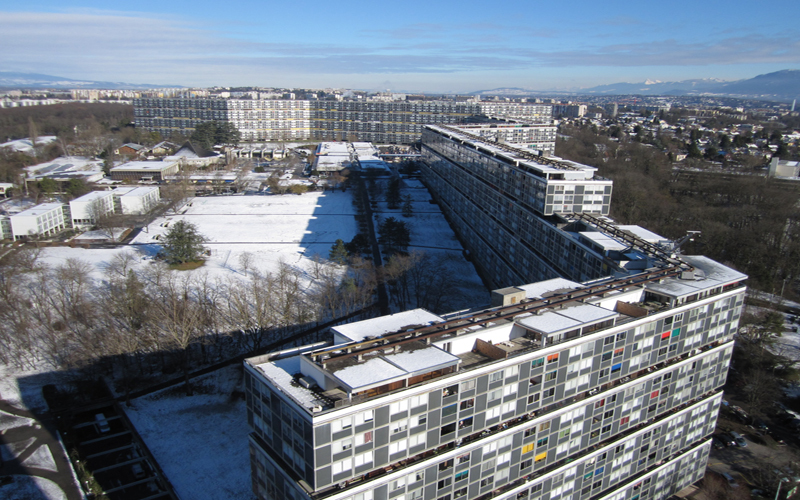 Concrete—reinforced, prestressed, cast-in-place, and precast—together with panelized window wall systems - was widely used and became most symbolic of the stark social housing architecture of the Post-war era as seen in the urban development Cité Du Lignon in Geneva, Switzerland (see photo below). New and lighter constructions met the desired visual impact of Modern movement architecture, which depended upon the impression of light and thin forms (Allen 1994, 151). Because the Modern movement sought to erase surface relief, its use of conventional detailing (i.e. overhangs, drip and sill edges, and copings) was generally inadequate. The performance of modern buildings and materials was not only physically compromised but, in some cases, aesthetically damaging. For example, staining from water run-off could impact a building’s appearance. The modern aesthetic also contributed to issues with air and water infiltration -- the thermal detailing of the envelope of the building had virtually no redundancy, thus allowing air and water to migrate easily through. Vapor barrier systems emerged conceptually in the 1940s, while sealants did not come into existence until the end of the 1950s. The use of thin forms, the fragility of the materials, and the vulnerability to air and water infiltration meant these building did not weather elegantly. The many Modern era buildings that exhibit these problems provide us with an opportunity -- and a challenge -- to continue research new preservation technologies. Building investigations and diagnostics are critical to identifying and responding to failure mechanisms inherent in the building assembly. A multidisciplinary, in-depth examination of these built-in deficiencies has been key to understanding the factors that impact the overall performance of building systems. Responding to building failures with short-term and long-term solutions is challenging. Monitoring techniques that use innovative diagnostic tools to examine building deficiencies can be extremely useful; with these tools and techniques, we can find appropriate solutions for improving long-term building performance while preserving built heritage. Studying building envelopes and their interior environments has long been considered a discipline that evolved in parallel with the Modern movement. However, as early as 1918, the discipline of Bauphysik(building physics) was made available through literature and research by companies specializing in energy plants and the heating industry (Tomlow 2006, 13). Today, building physics is recognized as an essential discipline that provides necessary tools for the examination and understanding of responses to climate. It also helps us appreciate what early pioneers were aiming to achieve through the use of thin-skin technologies (fig. 3). In many ways, the current debate on sustainability is not much different from the public health debate of the 1920s. More collaboration and research—on environmental monitoring and on climate control systems and the conservation of modern buildings—should be targeted to identify potential collaborations within the discipline of building physics in order to advance this area of practice. The physical conservation of modern buildings shares similar approaches to the preservation of more traditional buildings of previous eras. Certainly, the construction of modern thin-skin buildings requires more frequent monitoring and maintenance; in some cases, where building assembly failures are systemic, wide-scale intervention may need to be considered. Given the short life span of the materials, more loss of original building materials may be imminent, leading to the need for increased building system and material replacement. However, more focused research and training in building science, along with material research could advance physical conservation and improve building performance. Many professionals, building owners, and technicians in the construction industry would benefit from increased expertise in order to contribute to a more sustained approach to maintaining building performance. Kyle Normandin is an Associate Principal and Architectural Conservator for Wiss, Janney, Elstner Associates (WJE), a global firm of engineers, architects, and materials scientists specializing in the assessment and restoration of historic and contemporary buildings, structures, and national landmarks. For more information about WJE, please visit www.wje.com or e-mail us at WJE@thisispublicjournal.com. Allen, John. 1994. “Conservation of modern buildings.” In Building Maintenance and Preservation: A Guide for Design and Management, 2d rev. ed., ed. Edward D. Mills, 140–80. Oxford: Butterworth-Heinemann. Britton, Karla. 2001. August Perret. New York: Phaidon. Chandler, Ian, ed. 1991. Repair and Renovation of Modern Buildings. New York: McGraw-Hill. Cunningham, Allen. 1998. Modern Movement Heritage. London: E. and F. N. Spon. Davies, Colin. 1988. High Tech Architecture. New York: Rizzoli International Publications. De Jonge, Wessel. 2002. “The technology of change: The Van Nelle Factories in transition.” In Back from Utopia, the Challenge of the Modern Movement, ed. Hubert-Jan Henket and Hilde Heynen, 44–59. Rotterdam: 010 Publishers. 2008. “Comparing the preservation of the 1920s metal and glass curtain walls of the sanatorium “Zonnestraal” (1928–31) and the Van Nelle Factories (1928–31).” In Restoring Postwar Heritage, Preservation Technology Dossier 8, ed. Theodore H. M. Prudon and Kyle C. Normandin, 27–72. New York: Docomomo US. Mills, Edward. 1994. Building Maintenance and Preservation: A Guide for Design and Management. Oxford: Butterworth-Heinemann. Prudon, Theodore H. M. 2008. Preservation of Modern Architecture. New York: John Wiley and Sons. Tomlow, Jos. 2006. “Introduction: Building science as reflected in Modern Movement literature.” In Climate and Building Physics in the Modern Movement. Preservation Technology Dossier 9, ed. Jos Tomlow and Ola Wedebrunn, 6–16. Paris: Docomomo International. Walker, Anthony. 2001. “Plastics: The first universal building material.” In Preserving Post-War Heritage: The Care and Conservation of Mid-Twentieth-Century Architecture, ed. Susan Macdonald, 55–82. London: Donhead.